Note: These plans consist of a booklet of 19 pages of text, drawings and photos on 8.5" x 11" pages plus a 36" x 24" drawing. The printed version is black and white. The PDF file for instant download has color photograph. To save $10 and postage costs choose the download option below. Surprise your hunting buddies this fall with two-star accommodations in the woods, where you can all relax after a hard day of hunting, barbecue steaks on the deck, then sleep inside out of the weather. 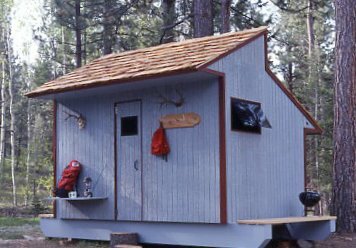 This small portable shelter makes a unique hunting camp or a cozy weekend vacation cabin. 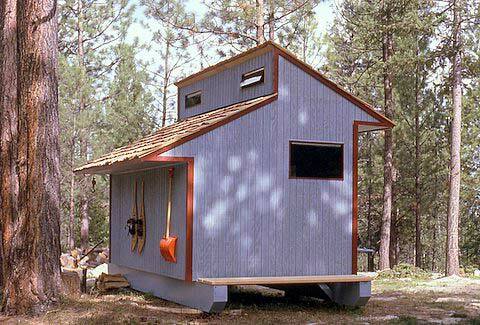 The basic cabin has also been adapted for refugee housing, back yard studios, storage shed and guest house. Multiple modules of the cabin have been joined together for basic accomodation for fly-in hunting in the Alaskan bush. For about $1000 a first class version can be built, and about half that amount for an economy version. 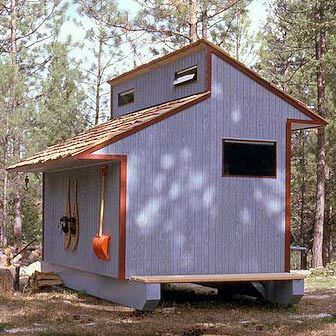 It can be built to take-apart if necessary, constructed in a back yard and re-assembled on site in the woods. The 8' by 12' floorplan plus sleeping/storage loft overhead provide about 140 square feet of usable space. Hollow plywood skid-beams provide structural support and also elevate the cabin above snow, or can be propped level about rough ground. Roof overhangs provide cover for stacked wood, boats, etc. Interior layout, door and window placement are optional. Optional insulation and a small wood stove provide winter comfort, or if an extension cord will reach the smallest 110 volt heaters will keep the cabin toasty. Building plans include nicely drawn blueprints and step-by-step instructions. Hi paul…..about 10 years back when you were still in Montana we emailed about a winter version of the Grand Cabin and I just wanted you to know I finally got around to doing some of the things we discussed. I put the cabin up on a crossed log platform about four feet above the ground. It was extra work but with the deep winter snows around Whitehorse it makes for a lot less shoveling. The best thing about the log platform is the dry enclosed space for gear and fire wood storage which is really handy. I used the smallest little wall mounted boat stove I could find, and with the sheet foam insulation the cabin heats up quick and cozy. The plywood sure simplifies this project, it would have been a tough job to build all this from logs. I still want to double the insulation on the floor and I’m looking for some fabric to cover the insulation on the walls. You’re right the wood paneling would have been a bad idea and too much work. Just wanted to send an update. Gordie.